Stud guns are industrial tools that usespecialblankcartridges tofiremetal nails or studs into wood, concrete, orsteel(Figure 10.2A). Theblankcar-tridges range in caliber from .22 to .38. Theyareloaded withfast-burning propellants that develop pressures toohighforafirearm to contain. Thus, they should never be used in firearms. Themouthof theseblankcartridges is sealed with a cardboard disk that is color-coded toindicatethestrength of the propellant. Stud guns have a built-in safety mechanismthat requiresaguardatthe end of the tool to be pressed firmly againstaflatsurfacebeforethe toolcan be fired. Workers have been known tousestudgunsfor "plinking" attin cans. They depress the safety guard with one hand and fire with the other. Figure 10.2 (A) Stud gun; (B) ricochet bolt. with a nail propelled by a .22 industrial blank propellant cartridge.9 A stellate-shaped entrance wound was present (Figure 10.3). 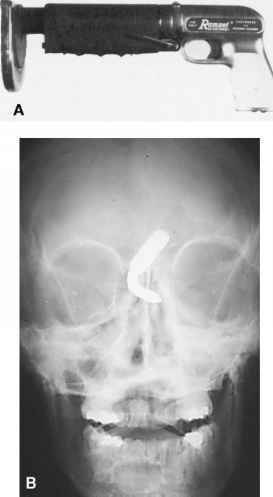 The nail perforated the head, lodging in a wall behind the deceased. 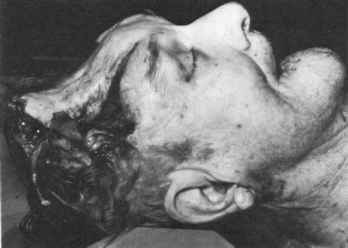 Interestingly, there was no visible soot blackening in the skin, soft tissue, or skull of the deceased.